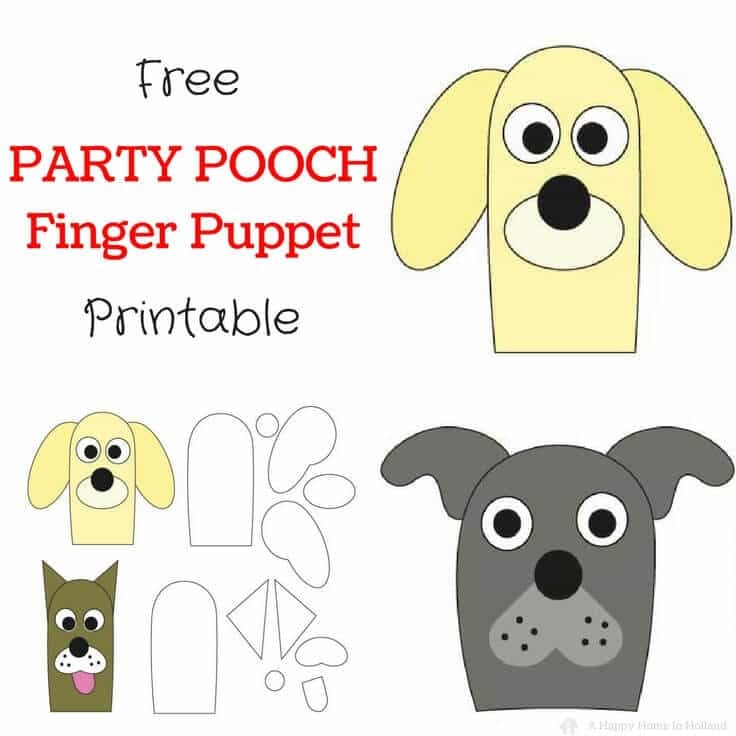 These cute little dog finger puppets are a great idea if you need a themed party favor or a craft idea to make with the kids. Hi everyone, I’m Sam from A Happy Home In Holland. 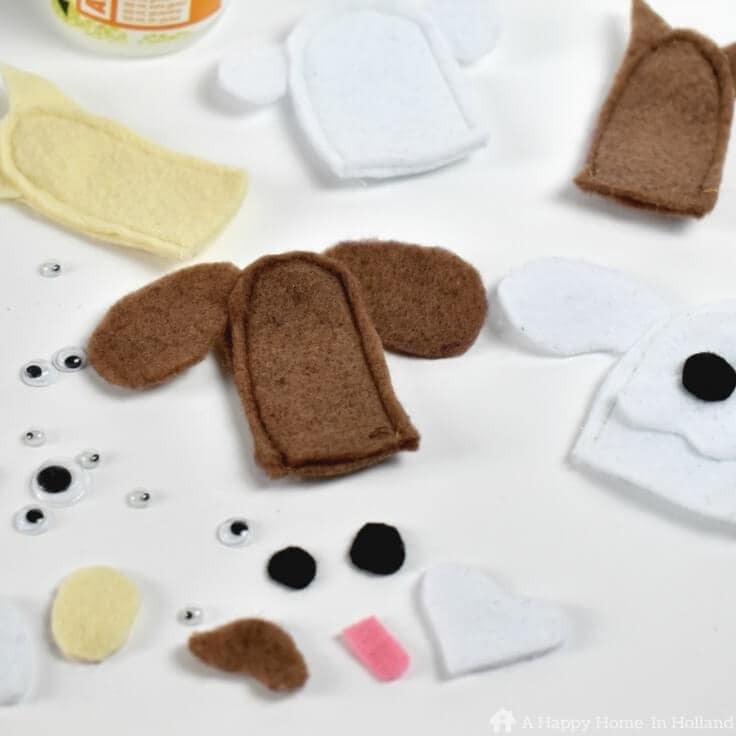 And as always, I’m happy to be back to share another cute craft idea with you all here on Kenarry. My daughter has just turned 7 in January and here in the Netherlands it is traditional to treat the other children at school with a ‘traktatie’ (small treat to eat or/and a little gift). This year, as my daughter is crazy about dogs and was having a dog themed party I decided to go along the same theme for school too. 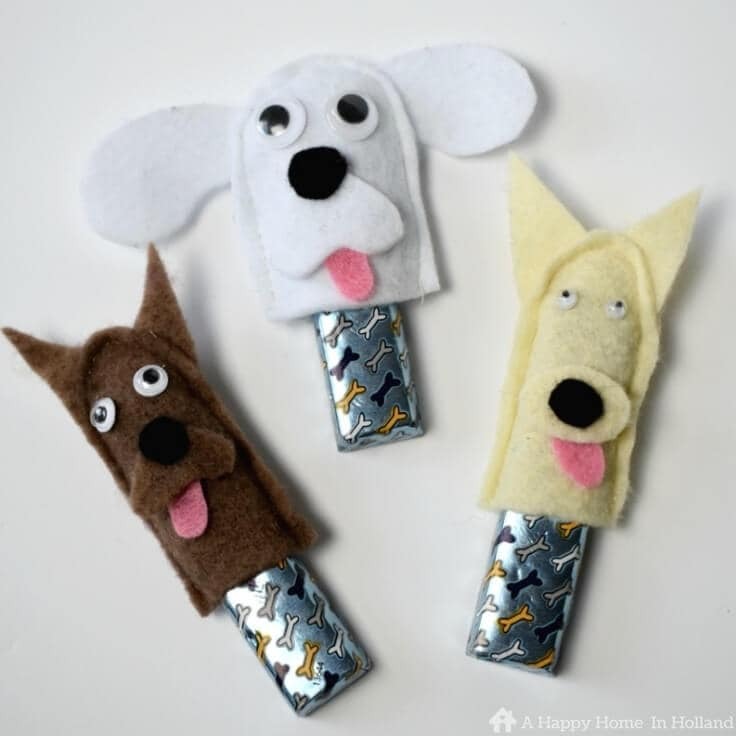 After a little bit of head scratching I came up with the idea of these super cute little dog finger puppets. 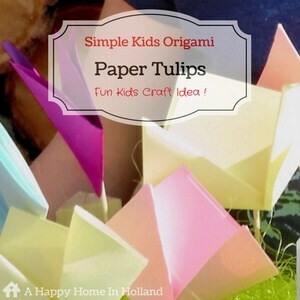 I thought I’d share this idea here as they are fun to make with the kids and also make great themed party favors. Not only are they cheap to make but really simple too. 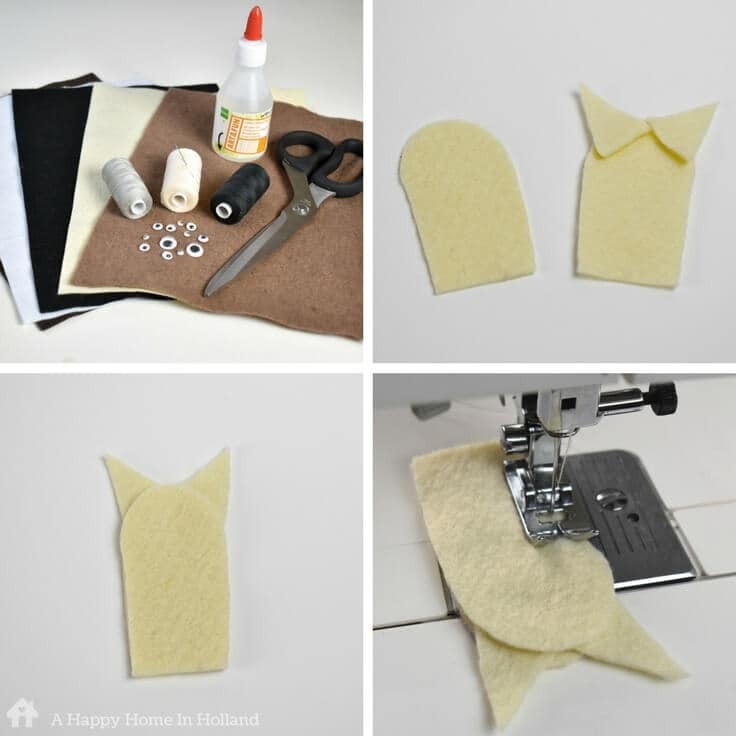 I did use a sewing machine to make mine (I had to make over 30) but you can just as easily sew them by hand. 2. Using the template provided cut all your pieces out (you’ll need two exactly the same for the head). 3. Place ears on between the two head pieces and sew together (obvious I know but remember not to sew the bottom bit). *Tip* If you are using a sewing machine it is easier if you slightly lift the presser foot as you are doing the rounded bit of the head. As you can see by the pictures my sewing machine skills are far from perfect, but this really doesn’t matter. If you do go a bit wonky you can always trim the edges of the felt so it doesn’t look too uneven. 4. Now the fun bit! Now you get to give these little fellows a bit of personality! 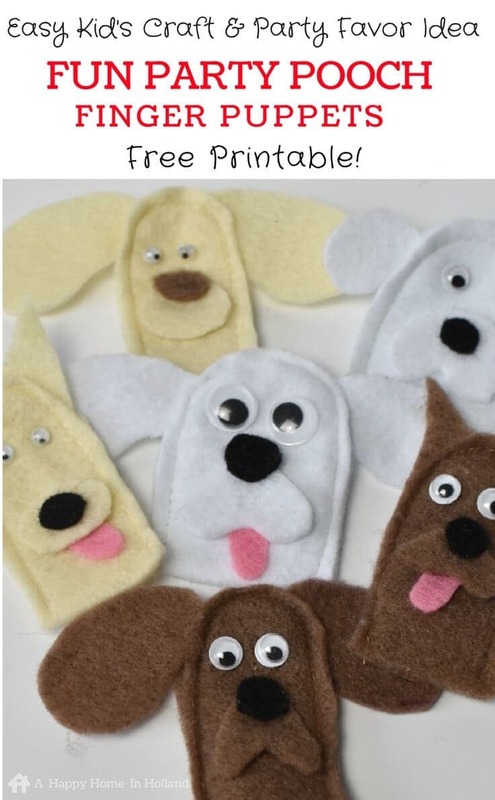 You can mix and match with the face pieces to give your dog finger puppets different characters. 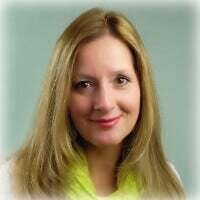 Once you have decided what is going where, simply glue them in to place. 5. 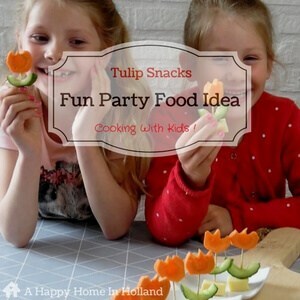 If you are going to be using these as party favors, it’s a fun idea to use them as a topper on top of a treat. For the ones that I did for my daughter’s class, I used a long marshmallow (cut in two). The marshmallows I had were a bit fat to fit inside the finger puppets so I just pushed a wooden tapas stick halfway in the top then popped the finger puppet on top. 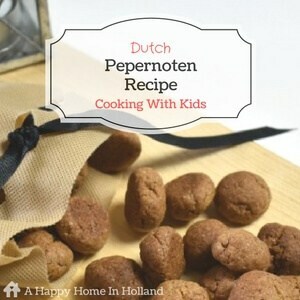 You can use them as toppers for all sorts of snacks and treats; bread sticks, candy etc. I also managed to find these really cute little chocolate bars with bones on the wrapper (see below). Needless to say these went down a storm! I displayed them in a pretty box and it was really nice to see all her classmates trotting out of the school happily playing with them on their fingers.